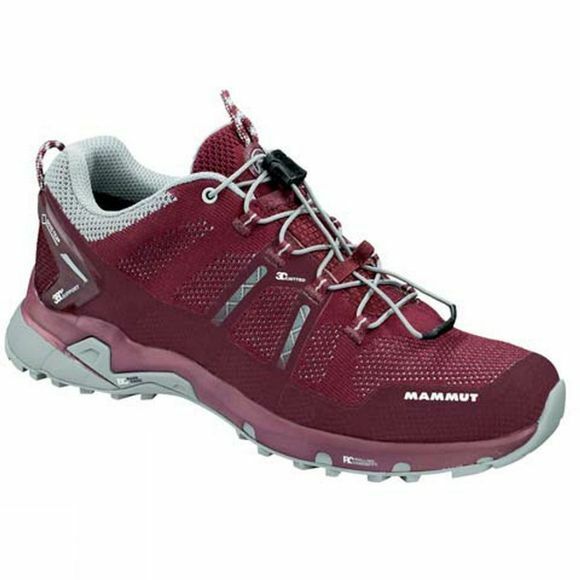 The Mammut Women's T Aegility Low GTX Shoe allows you to take on mountains at a fast pace. The shoe features gripex outsole technology, which provides hold on uneven terrain. The 3D-knitted elements mean that the shoe is elastic, well-ventilated and adapts to the shape of your foot. The hybrid shell combines soft inner materials and stable outer materials for enhanced comfort and a high level of adaptability, while the memo foam inside the shoe ensures an individual fit and cushions the instep, shin and ankle. Mammut's patented Rolling Concept® sole supports and cushions the foot. It also encourages the natural rolling movement of the foot, which prevents fatigue and in turn the risk of twisting your ankle. The 360 heel support is an abrasion-proof 3D-shaped heel element that supports the heel and prevents you from twisting your ankle.